Well, it’s been a very long day. I got up at 5am so I could try a travel experiment. Given my dislike for Victoria station I decided to take the scenic route to and from Cardiff for the weekend. That involves going from Brighton to Portsmouth (or Fratton to be precise), and then taking a train from there via Salisbury and Bath Spa. It takes about an hour longer than going via London, but I found it far less stressful. It’s also significantly cheaper, even for peak-time travel. And so it came to pass that I caught the 6.28 from Cardiff Central, and got to Falmer before lunch. Quite a pleasant journey, actually, although there were clear signs of recent flooding close to the track. I have a lecture from 5pm until 6pm on Mondays this term, so Mondays are going to be long days whether or not I travel, especially because I’m teaching a new course and am only just keeping up with writing the lectures given all the other things I have to do as Head of School. 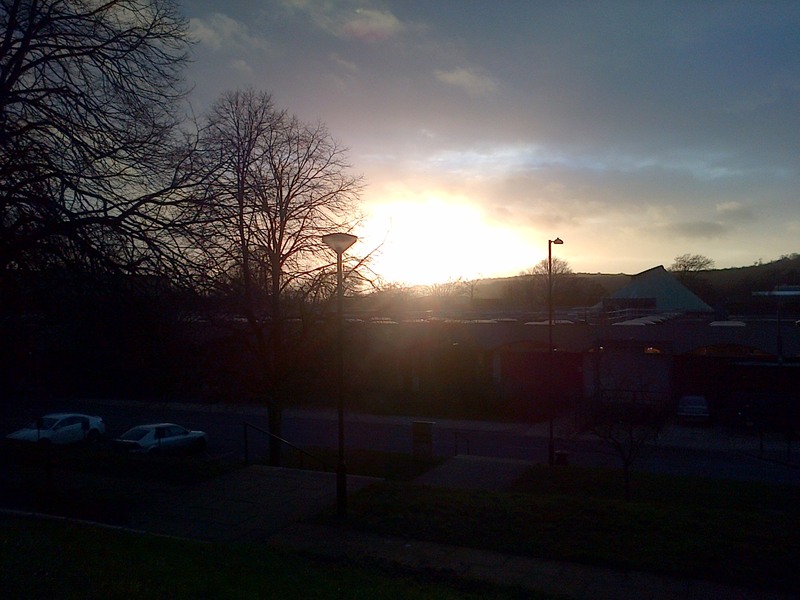 Here’s a picture I took just before the lecture, the sun going down across wintry Falmer. Talking of which, tomorrow is the University of Sussex Winter Graduation Ceremony and I have to present the graduands from the School of Mathematical and Physical Sciences. That means I’m going to have to spend the evening practicing some unfamiliar names, getting my posh clothes in order and (hopefully at some point) sleeping. This entry was posted on January 27, 2014 at 6:59 pm and is filed under Biographical. You can follow any responses to this entry through the RSS 2.0 feed. You can leave a response, or trackback from your own site. I can recall travelling between Cardiff and Brighton twice, and used the Cardiff-Bristol-Fareham-Chichester-Brighton route on both occasions. It was slow but got me there and back. Admittedly, there were severe delays when the line was closed after a motorist drove a car on to the railway at a level crossing, and the car exploded into flames when it made contact with the electrified power rail. It all went smoothly for me yesterday. Certainly no adventures on the scale you describe! Once upon a time there was a direct Cardiff to Brighton service, but it was discontinued some time ago necessitating a change either at Southampton or Fratton. Analogously, it can be pleasant to drive long distances using mainly B roads when you are not in a hurry. Peter, do you wear the old style Sussex gown, or the new fancy one? There is also a lot to be saved by splitting a journey. I remember meeting Ian Browne at the airport on Tenerife. I asked him what his flight from Manchester had cost, and he said “less than a train to London”.